I do not know how many times I have watched Buffalo ’66. I love it! 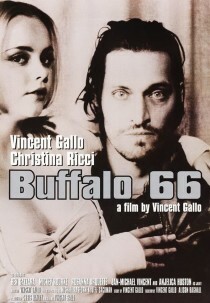 This is the brilliant debut of director/writer/actor/musician, Vincent Gallo. It is an independent film which Gallo, after having played small parts in 13 feature films, wrote, directed and scored. Casting himself as the star, Gallo managed to bring in the exceptional talents of Christina Ricci (at her sweetest ever), Ben Gazzara, Anjelica Huston, Mickey Rourke and Rosanna Arquette. Buffalo ’66 is a movie that takes you places you have never been before. It is, if your tastes accommodate it, a thoroughly expressive piece of art which will spark within you many emotional reactions. Buffalo ’66 is recognised as a cult classic and rightly so. This film has an excellent beginning scene. It’s priceless. I love Christina Ricci’s very interesting dance in this movie. 🙂 And also, the whole movie. I’d forgotten about this movie. Time for a re-watch. Thanks so much for reminding me of this fantastic film, I am going to reference in my screenwriting class in our discussions about character (and probably some other classes as well). It is a flawless piece of filmmaking. Great film! Awesome interview with the critics. Mr. Gall just earned more cool points from me. Such a good interview; he totally smoked those critics. Can definitely see the influence of Ozu as he describes him in The Brown Bunny, too. I had issues with this film on release Shimky. I thought that Gallo was self-indulgent, and wildly over-acting. I watched it again on TV, just two days ago, and I still feel the same about Gallo. However, the rest of the cast are a joy, and make the film. As for Christina Ricci (in this film), I could watch her for the full running time, just walking around, she looks that good. Pete, you’re dead on about Gallo but I think this performance perfectly fits the film. Apparently he treated Ricci really badly during filming.